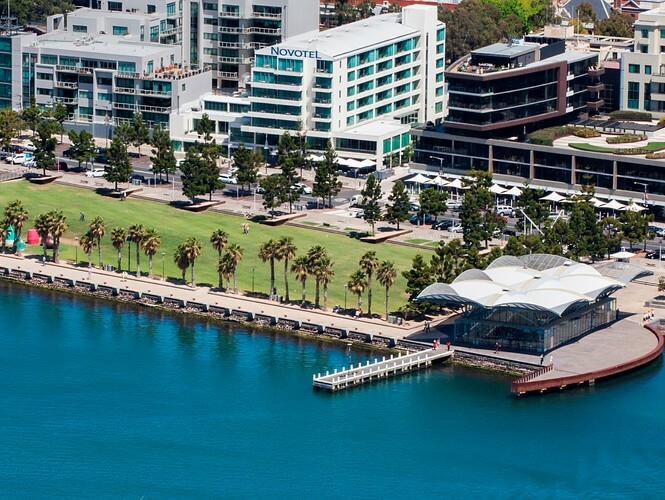 Novotel Geelong is the region’s premier hotel, located in the heart of the waterfront with amazing views across the bay. The hotel is perfectly situated within Geelong’s central business district and close to great shopping and local attractions – all within an hour’s drive from Melbourne and 20 minutes from Avalon Airport. Offering the best for business and leisure travellers, Novotel Geelong features 109 guest rooms. Enjoy modern amenities and comfortable style in any of the spacious guest rooms, all of which feature a balcony and complimentary Wi-Fi. With a focus on wellbeing and family, the hotel is 100% non-smoking and offers children welcome gifts and healthy menus. Novotel Geelong also features a restaurant and bar located on the ground level and boasting a stunning alfresco area. Make a deliciously healthy start to your day with Novotel’s fresh breakfast buffet every day, featuring barista coffee, bakery fresh bread, organic options and fresh juices. Enjoy delicious Mediterranean-influenced a la carte and tapas menus, featuring the freshest local produce and seasonal specials and complemented by local wines. The In Balance Fitness Centre at Novotel Geelong is located on level two of the hotel. Work out in the fitness centre which offers cardiovascular equipment - complete with a wall-mounted LCD TV. Take a dip in the indoor heated saltwater pool or soak up the sun on the outdoor sundeck overlooking Steampacket Gardens and the bay. Also featuring a steam room, changing room and bathroom, open 24 hours a day, seven days a week.